For such a small size book, it is overflowing with inspiration, utilizing herbs around the home and garden to create a relaxing spa. Who doesn’t need a way to decompress from information overload in our daily routines? 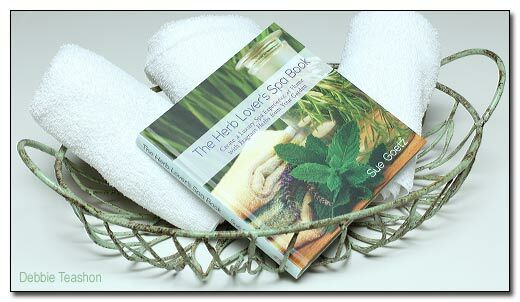 Sue Goetz put together an exciting little book, full of beautiful images, which shows us how to employ herbs to do our bodies good. Yet she also shows us how to create relaxing vignettes in the garden, and gives numerous tips on how to relax using herbal infusions, tea, tub tea, and more. When I picked the book up, the beautiful hard cover had a soft, sensual feel to it. It is small enough to read comfortably while taking an herbal bath. The hardest part about owning this book is what category to file it under in my library—as a garden book, or do I nestle it in with the recipe books? This would be great to keep by the bedside to remind me of all the ways I can grow and/or use herbs to take care of my body, mind, and spirit. 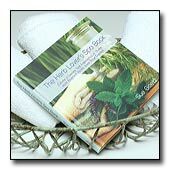 I can’t wait for spring to try out a few spa treatments using fresh herbs out of my garden!